Looking for the best bass amp for giggin around town? See my top picks for both small and large venues to make sure you can get all the power you need. In a lot of gigging situations you’ll be running your bass guitar into the house PA system, so you can get away with using a small bass amp as an on-stage monitor. But what if you don’t have a PA system to use? After hours of research I’ve created a list to help you find the best bass amp for gigging whether you are playing in a small jazz club or a large theater. Let’s take a look! How Many Watts Do I Need? When you aren’t using a PA system, a good rule of thumb is to use double the wattage as the guitar player. In general, bass amps will need to use more watts than a guitar amp since it needs to push the low-end signal harder. While a 100-watt bass amp is good for practice, you might want to consider an amp in the 200-400 watt power range for small venues. Since the low frequencies draw a lot of power for moving the large speakers, you’ll need something up to the task. If you are playing very soft music in a small room, however, you can probably get away with 100 watts just fine. It’s important to note that bass amps sound the best when they are not pushed too hard. It will sound better having a 500 watt amp at half volume than using a 200 watt amp on full blast. Having that extra headroom will allow for a clean undistorted tone that showcases the best attributes of the amplifier. What Size Speaker Do I Need? When searching for bass amps to buy you’ll see a large variety of speaker sizes available. Some of the most popular are the 4 x 10″, 1 x 15″, 1 x 18″, and 8 x 10″. What do the numbers mean? The second number is the size of the speaker, and the first number is how many there are. Each size can help bring out different characteristics of the bass guitar. The smaller sizes like 8 and 10 inch speakers can give your bass a nice tight pop, while larger diameter speakers will give your sound more depth and warmth but can sometimes sound muddy. 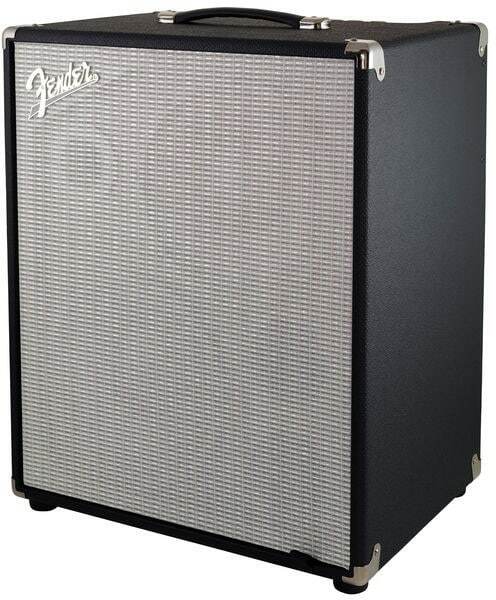 Many bassists love using a 4 x 10” cabinet for live gigs. Even though a 2 x 15” speaker can sound warmer and in some cases louder, the 4 x 10” has a great midrange response than can cut through the other instruments and project well into any venue. Despite this, some bassists still prefer using a single speaker with 1 x 12” or 1 x 15”, and some others love using things like 4 x 10” or 6 x 10”. It all comes down to personal preference. For larger venues, some bassists will combine a 1 x 15” with a 4 x 10” to get the best of both worlds - utilizing a crossover to send the low end to the 15” speaker and the mid/high ranges to the 10” speakers for that tight punch. It’s important to note that with most modern cabinets, speaker size doesn’t matter as much as it used to. Because of technological advancements the quality of sound has more to do with the overall design of the cabinet. The Fender Rumble is a powerhouse in a lightweight and portable package. Coming in at 36.5 lbs. and 17.91” x 27.55” x 22.84”, it’s easy to transport and is a great bass amp for small gigs. The reason I went with the 500 watt version over the 200 watt is because the 500 watt amp comes with 2 x 10” speakers compared to just 1 x 15” speaker. The 10” speakers allow the bass to cut through the mix much better and it seems to project further. You also get the benefit of less muddiness overall and a more clear midrange tone. There’s nothing but great reviews for this amp all over the internet so you’ll be happy to know that it is highly regarded in the bass community. There are 3 tone-shaping options on the front - bright, contour, and vintage - each of which color you tone in a slightly different way. Bright makes your bass tone nice and punchy, contour gives a bit of a mid scoop and is great for slap bass, and vintage adds simulated tube warmth to the signal. One cool feature is that you can combine different tone options together to create unique blends. The bright and contour together sound great and fit really well into the mix. You’ll also have access to a 4-band EQ with controls for bass, low mid, high mid, and treble. One of my favorite features of the Fender Rumble 500 is the built-in overdrive. It’s great for adding just a little bit of that saturated tube warmth or for going completely balls-to-the-wall and adding tons of fuzz to your tone, and it’s also foot-switchable. Throw in one of our recommended compressor pedals and you’ll have yourself a tone that’s hard to beat. There’s an external speaker hookup option on the back if you want to increase wattage from the stock 350 that the cab puts out to 500 with an extension cab. It also has a high frequency horn switch allowing you to turn it on and off which is great for slap bass players. An FX loop and XLR line out are also available allowing you to go into a PA system for live performances. For the size, weight, and amazing bass tone this thing puts out I’m seriously impressed. The Fender Rumble 500 not only gets my vote for the best bass amp for small gigs, but also for best lightweight bass amp. For large gigs you’ll want something that can reach everybody in the crowd with little effort. 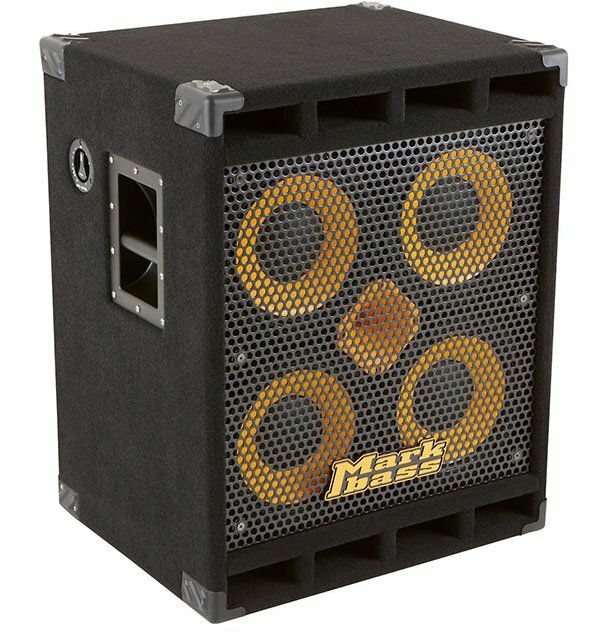 The 800 watt 4 x 10” speakers on the Markbass 104HF Cabinet are more than enough for the job. The Standard 104HF bass cab is made of high-grade, multi-ply poplar and features protective corners and a grill to protect it from traveling mishaps. I would describe the overall sound as vintage and it has very excellent sounding rich mids. Adding in the Little Mark Tube 800 Bass Amp Head is where the real fun begins. The 2 bendable preamps in this 800 watt beast allow you to choose between a rich tube preamp, a clean solid state preamp, or a mixture of both. The front panel features 2 inputs each with their own gain controls, a ¼” input, and an XLR + ¼” combo input. The Vintage Loudspeaker Emulator (VLE) and Variable Preshape Filter (VPF) allow you to shape your tone anywhere from classic up to modern hi-fi. The Little Mark Tube 800's phantom power switch accompanies the XLR input, for using a microphone on a double bass. Mute control is as simple as a push and a pull on the master volume switch. Additional features include four bands of equalization, line out control, and pre-post EQ switch for the XLR out (on the rear panel). For the low price, this is a great deal for all the features you get - not to mention the great sound produced. Hartke has been around for a while and produced the first aluminum bass speaker cones into one of Jaco Pastorius's old 810 cabinets, which he fell in love with and used on almost every concert. 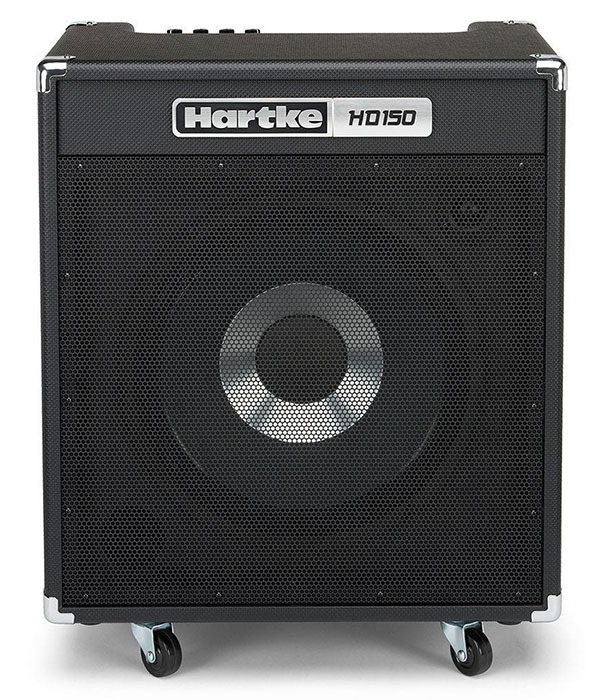 The Hartke HD150 is a 150 watt bass combo amp featuring a 1 x 15” speaker. By combining the warmth and roundness of paper with the punch and attack of aluminum, their patented HyDrive speaker design produces an incredible tone that is ideal for bass players of all genres and styles. On the top you’ll get standard volume, bass, mid and treble controls. The best part is that it comes with a 7-band graphic EQ so you can shape your tone to your heart's content. It also has a 1/8" stereo Aux input for jamming along with your favorite tracks via an MP3 player and a 1⁄4" headphone output for practicing silently with a pair of great headphones for bass playing. The XLR output allows for routing to a mixer or PA system as well, and the built in limiter is a great addition to make sure you stay at safe levels. While you won’t be able to fill up a large venue with the HD150, it’s perfect for small gigs and it wins my vote for best bass amp on a budget. 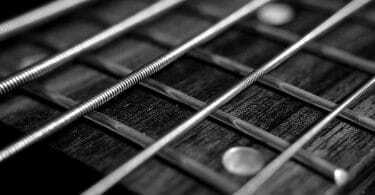 Should I Buy A 4 Or 5 String Bass? 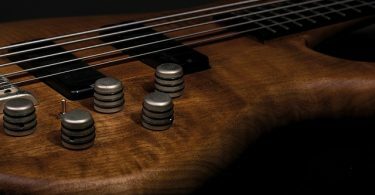 Fretless Bass Pros and Cons – Is It A Good Choice?